while Fr. Benedict Groeschel was recovering from injuries after being hit by a car in 2004, he co-authored the book There Are No Accidents: In All Things Trust in God? the Tunnel de la mort (Death tunnel), an intersection in Montreal, was the scene of an inordinate number of serious car accidents? the Caterham CSR is one of the lightest production cars, but lacks modern safety features, making it unsafe in collisions? Heinie Reitz was the first Major League baseballer to die in a car accident? A traffic collision (motor vehicle collision, motor vehicle accident, car accident, or car crash) is when a road vehicle collides with another vehicle, pedestrian, animal, road debris, or other geographical or architectural obstacle. Traffic collisions can result in injury, property damage, and death. A number of factors contribute to the risk of collision including; vehicle design, speed of operation, road design, and driver impairment. Worldwide motor vehicle collisions lead to significant death and disability as well as significant financial costs to both society and the individual. Many different terms are commonly used to describe vehicle collisions. The World Health Organization use the term road traffic injury, while the U.S. Census Bureau uses the term motor vehicle accidents (MVA) and Transport Canada uses the term "motor vehicle traffic collision". Other terms that are commonly used include auto accident, car accident, car crash, car smash, car wreck, motor vehicle collision (MVC), personal injury collision (PIC), road accident, road traffic accident (RTA), road traffic collision (RTC), road traffic incident (RTI), road traffic accident and later road traffic collision, as well as more unofficial terms including smash-up and fender bender. As the factors involved in collisions have become better understood, some organizations have begun to avoid the term "accident," as the word suggests an unpreventable, unpredictable event and disregards the opportunity for the driver(s) involved to avoid the crash. Although auto collisions are rare in terms of the number of vehicles on the road and the distance they travel, addressing the contributing factors can reduce their likelihood. For example, proper signage can decrease driver error and thereby reduce crash frequency by a third or more. That is why these organizations prefer the term "collision" rather than "accident". However, treating collisions as anything other than "accidents" has been criticized for holding back safety improvements, because a culture of blame may discourage the involved parties from fully disclosing the facts, and thus frustrate attempts to address the real root causes. Motor vehicle collisions can be classified by mechanism. Common mechanisms include head-on collisions, run-off-road collisions, rear-end collisions, side collision, and rollovers. Whether an injury is reported may depend upon local law, compensation and medical procedures as well as on the amount of harm. The definition of a road-traffic fatality varies from country to country. In the United States, for example, the definition used in the Fatality Analysis Reporting System (FARS) run by the NHTSA is a person who dies within 30 days of a crash on a US public road involving a vehicle with an engine, the death being the result of the crash. In the United States therefore, if a driver has a non-fatal heart attack that leads to a road-traffic crash that causes death, that is a road-traffic fatality. However, if the heart attack causes death prior to the crash, then that is not a road-traffic fatality. The definition of a road accident fatality can change with time in the same country. For example, fatality is defined in France as a person who dies in the 6 days (pre 2005) after the accident; in the 30 days (post 2005) after the accident..
A 1985 study by K. Rumar, using British and American crash reports as data, found that 57% of crashes were due solely to driver factors, 27% to combined roadway and driver factors, 6% to combined vehicle and driver factors, 3% solely to roadway factors, 3% to combined roadway, driver, and vehicle factors, 2% solely to vehicle factors and 1% to combined roadway and vehicle factors. alertness, reading and anticipating the behaviour of other drivers. "the feeling of being confident in more and more challenging situations is experienced as evidence of driving ability, and that 'proven' ability reinforces the feelings of confidence. Confidence feeds itself and grows unchecked until something happens – a near-miss or an accident". It can safely be said that many places which look dangerous do not have accidents, or very few. Conversely, a location that does not look dangerous may have a high crash frequency. The reason for this is simple. If drivers perceive a location as hazardous, they take more care and there are no accidents. Accidents happen when hazardous road or traffic conditions are not obvious at a glance, or where the conditions are too complicated for the limited human machine to perceive and react in the time and distance available. This phenomena has been observed in risk compensation research, where the predicted reductions in accident rates have not occurred after legislative or technical changes. One study observed that the introduction of improved brakes resulted in more aggressive driving, and another argued that compulsory seat belt laws have not been accompanied by a clearly-attributed fall in overall fatalities. In the 1990s Hans Monderman's studies of driver behavior led him to the realization that signs and regulations had an adverse effect on a driver's ability to interact safely with other road users. Monderman developed shared space principles, rooted in the principles of the woonerven of the 1970s. He found that the removal of highway clutter, while allowing drivers and other road users to mingle with equal priority, could help drivers recognize environmental clues. They relied on their cognitive skills alone, reducing traffic speeds radically and resulting in lower levels of road casualties and lower levels of congestion. Relative risk of speeding in an urban 60 km/hr zone. That the severity of a crash depends on the vehicle speed change at impact. The Road and Traffic Authority (RTA) of the Australian state of New South Wales (NSW) asserts speeding (travelling too fast for the prevailing conditions or above the posted speed limit) is a factor in about 40 percent of road deaths. The RTA also say speeding increases the risk of a crash and its severity. On another webpage, the RTA qualify their claims by referring to one specific piece of research from 1997, and stating "research has shown that the risk of a crash causing death or injury increases rapidly, even with small increases above an appropriately set speed limit." Driving faster or slower than the flow of traffic — which may or may not accord with the posted speed limit — has robustly been demonstrated to increase the likelihood and severity of crashes, as shown by the Solomon Curve. The contributory factor report in the official British road casualty statistics show for 2006, that "exceeding speed limit" was a contributory factor in 5% of all casualty crashes (14% of all fatal crashes), and that "travelling too fast for conditions" was a contributory factor in 11% of all casualty crashes (18% of all fatal crashes). Taking recommended doses of several drugs together, which individually will not cause impairment, may combine to bring on drowsiness or other impairment. This could be more pronounced in an elderly person whose renal function is less efficient than a younger person's. Research has shown that careful design and maintenance, with well-designed intersections, road surfaces, visibility and traffic control devices, can result in significant improvements in accident rates. Individual roads also have widely differing performance in the event of an impact. In Europe there are now EuroRAP tests that indicate how "self-explaining" and forgiving a particular road and its roadside would be in the event of a major incident. In the UK, research has shown that investment in a safe road infrastructure programme could yield a ⅓ reduction in road deaths saving as much as £6billion per year. A consortium of 13 major road safety stakeholders have formed the Campaign for Safe Road Design which is calling on the UK Government to make safe road design a national transport priority. A well-designed and well-maintained vehicle, with good brakes, tires and well-adjusted suspension will be more controllable in an emergency and thus be better equipped to avoid collisions. Some mandatory vehicle inspection schemes include tests for some aspects of road worthiness, such as the UK's MOT test or German TÜV conformance inspection. In the early 1970s British Leyland started an intensive programme of vehicle safety research, producing a number of prototype experimental safety vehicles demonstrating various innovations for occupant and pedestrian protection such as: air bags, anti-lock brakes, impact-absorbing side-panels, front and rear head restraints, run-flat tyres, smooth and deformable front-ends, impact-absorbing bumpers, and retractable headlamps. Design has also been influenced by government legislation, such as the Euro NCAP impact test. Common features designed to improve safety include: thicker pillars, safety glass, interiors with no sharp edges, stronger bodies, other active or passive safety features, and smooth exteriors to reduce the consequences of an impact with pedestrians. Now about 40% of new US vehicles, mainly the SUVs, vans and pickup trucks that are more susceptible to rollover, are being produced with a lower center of gravity and enhanced suspension with stability control linked to its anti-lock braking system in order to reduce the risk of rollover, and meet US federal requirements that will mandate anti-rollover technology by September 2011. A large body of knowledge has been amassed on how to prevent car crashes, and reduce the severity of those that do occur. See Road Traffic Safety. Many jurisdictions require the collection and reporting of road traffic incident statistics. Such data enables figures for deaths, personal injuries, and possibly property damage to be produced, and correlated against a range of circumstances. Analysis of this data may allow incident clusters and incident causes to be identified. Owing to the global and massive scale of the issue, with predictions that by 2020 road traffic deaths and injuries will exceed HIV/AIDS as a burden of death and disability, the United Nations and its subsidiary bodies have passed resolutions and held conferences on the issue. The first United Nations General Assembly resolution and debate was in 2003 The World Day of Remembrance for Road Traffic Victims was declared in 2005. In 2009 the first high level ministerial conference on road safety will be held in Moscow. Disability-adjusted life year for road traffic accidents per 100,000 inhabitants in 2004. Worldwide it was estimated in 2004 that 1.2 million people were killed (2.2% of all deaths) and 50 million more were injured in motor vehicle collisions. This makes motor vehicle collisions the leading cause of death among children worldwide 10 – 19 years old (260,000 children die a year, 10 million are injured) and the sixth leading preventable cause of death in the United States (45,800 people died and 2.4 million were injured in 2005). In Canada they are the cause of 48% of severe injuries. The safety performance of roadways are almost always reported as rates. That is, some measure of harm (deaths, injuries, or number of crashes) divided by some measure of exposure to the risk of this harm. Rates are used so the safety performance of different locations can be compared, and to prioritize safety improvements. The fardier a vapeur of Nicholas Cugnot allegedly crashed into a wall in 1771. The world’s first road traffic death involving a motor vehicle is alleged to have occurred on 31 August 1896. An Irish scientist Mary Ward died when she fell out of her cousins' steam car and was run over. German-English composer George Frideric Handel was seriously injured in a carriage crash in 1752. The British road engineer J. J. Leeming, compared the statistics for fatality rates in Great Britain, for transport-related incidents both before and after the introduction of the motor vehicle, for journeys, including those by water, which would now be undertaken by motor vehicle: For the period 1863–1870 there were: 470 fatalities per million of population (76 on railways, 143 on roads, 251 on water); for the period 1891–1900 the corresponding figures were: 348 (63, 107, 178); for the period 1931–1938: 403 (22, 311, 70) and for the year 1963: 325 (10, 278, 37). Leeming concluded that the data showed that "travel accidents may even have been more frequent a century ago than they are now, at least for men". In 1969 a British road engineer, compared the circumstances around road deaths as reported in various American states before the widespread introduction of 55 mph speed limits and drunk-driving laws. (a) The percentage of the total state highway mileage that is rural. (b) The percent increase in motor vehicle registration. (c) The extent of motor vehicle inspection. (d) The percentage of state-administered highway that is surfaced. (e) The average yearly minimum temperature. (f) The income per capita. The global economic cost of MVCs was estimated at $518 billion per year in 2003 with $100 billion of that occurring in developing countries. The Center for Disease Control and Prevention estimated the U.S. cost in 2000 at $230 billion. Convictions for traffic violations are usually penalized with fines, and for more severe offenses, the suspension or revocation of driving privileges. Convictions for alcohol offenses generally result in the revocation or long term suspension of the driver's license, and sometimes jail time and/or mandatory alcohol rehabilitation. J. G. Ballard's renowned novel Crash presented a dystopian vision of the car-dominated world, where car crashes become an object of sexual obsession, and introduced the notion of Autogeddon (from Armageddon), a fictional ultimate car disaster that will destroy the world. The novel was made into a film of the same name by David Cronenberg. Heathcote Williams' poem Autogeddon satirizes human addiction to driving and bemoans the millions of deaths incurred by traffic collisions. A BMW Z3 after rolling in a ditch. Emergency responders at an accident in Colorado Springs, Colorado. A Honda Accord after colliding with a building. Wreckage of a crash from Saragossa, Spain. The car, a Seat Ibiza Mk 3, suffered extensive damage but the interior was largely unscathed. ^ a b "WHO | World report on road traffic injury prevention". http://www.who.int/violence_injury_prevention/publications/road_traffic/world_report/en/index.html. ^ "The 2009 Statistical Abstract: Motor Vehicle Accidents and Fatalities". http://www.census.gov/compendia/statab/cats/transportation/motor_vehicle_accidents_and_fatalities.html. ^ "Statistics and Data - Road and Motor Vehicle Safety - Road Transportation - Transport Canada". http://www.tc.gc.ca/eng/roadsafety/resources-researchstats-menu-847.htm. ^ Charles, Geoffrey (11 March 1969). "Cars And Drivers Accident prevention instead of blame". The Times. ^ a b c Harry Lum & Jerry A. Reagan (Winter 1995). "Interactive Highway Safety Design Model: Accident Predictive Module". Public Roads Magazine. http://www.tfhrc.gov/pubrds/winter95/p95wi14.htm. ^ [http://drivers.com/article/157 "I'm a good driver: you're not!"]. Drivers.com. 2000-02-11. http://drivers.com/article/157. ^ a b c "The Good, the Bad and the Talented: Young Drivers' Perspectives on Good Driving and Learning to Drive" (PDF). Transport Research Laboratory. January 2007. http://www.dft.gov.uk/pgr/roadsafety/research/rsrr/theme2/pdfgoodbadtalenteddriver.pdf. Retrieved 2008-01-04. ^ Thew, Rosemary (2006). "Royal Society for the Prevention of Accidents Conference Proceedings" (PDF). Driving Standards Agency. http://www.rospa.com/roadsafety/conferences/congress2006/proceedings/day2/thew.pdf. ^ "forecasting older driver's accident rates". Department for Transport. http://www.dft.gov.uk/pgr/roadsafety/research/rsrr/theme3/forecastingolderdriveraccide4767. ^ a b c d e Leeming, J.J. (1969). Road Accidents: Prevent or Punish?. Cassell. ISBN 0-304-93213-2. ^ Sagberg, Fosser, & Saetermo (1997). An investigation of behavioral adaptation to airbags and antilock brakes among taxi drivers (29 ed.). Accident Analysis and Prevention. p. 293–302. ^ Adams, John (1982). "The efficacy of seat belt legislation" (PDF). SAE Transactions. http://www.geog.ucl.ac.uk/~jadams/PDFs/SAE%20seatbelts.pdf. ^ Ben Hamilton-Baillie (Autumn 2005) (PDF). Streets ahead. Countryside Voice. http://www.hamilton-baillie.co.uk/papers/Countryside_Voice1.pdf. Retrieved 2008-03-10. ^ a b "www.infrastructure.gov.au". http://www.infrastructure.gov.au/roads/safety/publications/1997/pdf/Speed_Risk_1.pdf. ^ "Synthesis of Safety Research Related to Speed and Speed Limits". U.S. Department of Transportation. http://www.tfhrc.gov/safety/speed/speed.htm. Retrieved 2008-03-05. ^ "Problem definition and countermeasures". NSW Roads and Traffic Authority. http://www.rta.nsw.gov.au/roadsafety/speedandspeedcameras/problemdefinitionandcountermeasures.html. Retrieved 2008-05-20. ^ a b "The biggest killer on our roads". NSW Roads and Traffic Authority. http://www.rta.nsw.gov.au/roadsafety/speedandspeedcameras/index.html. Retrieved 2008-03-05. ^ "Speeding research". NSW Roads and Traffic Authority. http://www.rta.nsw.gov.au/roadsafety/speedandspeedcameras/speedingresearch.html. Retrieved 2008-03-05. ^ "Testimony of Julie Anna Cirillo". Land Line Magazine (OOIDA). 2003-06-10. http://www.landlinemag.com/Special_Reports/2003/June03/Cirillo_Testimony.htm. Retrieved 2009-03-02. ^ "Road Casualties Great Britain: 2006" (PDF). UK Department for Transport. http://www.dft.gov.uk/162259/162469/221412/221549/227755/rcgb2006v1.pdf. Retrieved 2008-03-05. ^ "www.tc.gc.ca" (pdf). Transport Canada. p. 20. http://www.tc.gc.ca/media/documents/roadsafety/tp11759e_2000.pdf. ^ "Road Safety Part 1: Alcohol, drugs, ageing & fatigue". UK Department for Transport. Spring 2003. http://www.dft.gov.uk/pgr/roadsafety/research/newsletters/roadsafetypart1alcoholdrugsa4708#TopOfPage. Retrieved 2008-01-01. ^ Ray Fuller, Jorge A. Santos (2002). Emerald. p. 14. ISBN 0080434126, 9780080434124. http://books.google.com/books?hl=en&id=I3dl6bJZK9cC&dq. ^ Hill, Joanne. "Getting Ahead: Returning Britain to European leadership in road casualty reduction" (PDF). Campaign for Safe Road Design. http://www.saferoaddesign.com/media/1752/bookletweb.pdf. Retrieved 2008-10-01. ^ "SAFE ROAD DESIGN TO SAVE UK £6BN EVERY YEAR" (Word DOC). Campaign for Safe Road Design. http://www.saferoaddesign.com/media/2024/safe%20roads%20final.doc. Retrieved 2008-10-01. ^ a b Broughton & Walter (February 2007). Trends in Fatal Car Accidents: Analyses of data. Transport Research Laboratory. ^ David Bjerklie (2006-11-30). "The Hidden Danger of Seat Belts". Time Inc. http://www.time.com/time/nation/article/0,8599,1564465,00.html. Retrieved 2008-02-26. ^ "Safety First: the SSV/SRV cars". AROnline. Keith Adams. http://www.austin-rover.co.uk/index.htm?researchsrvf.htm. ^ "Annual transport accidents and casualties". UK Department for Transport. http://www.dft.gov.uk/pgr/statistics/datatablespublications/accidents/. Retrieved 2008-01-01. 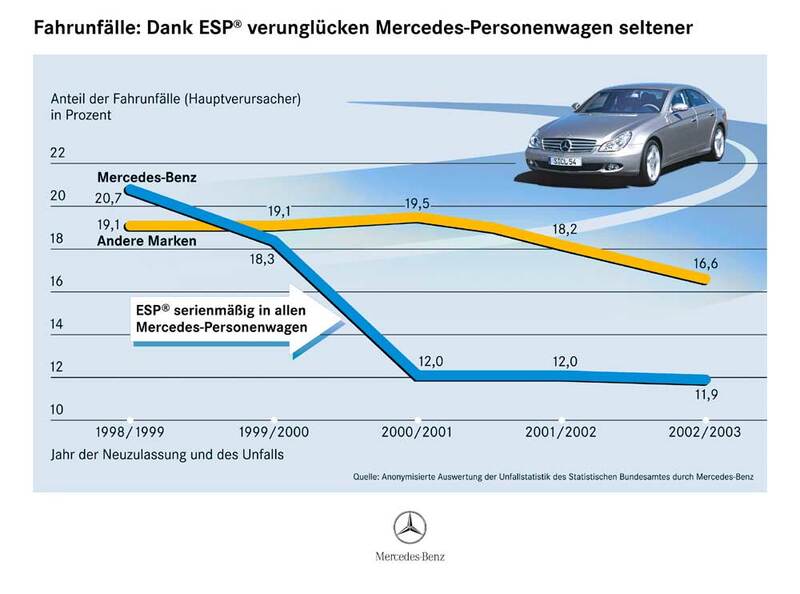 ^ (Graph of accident share) Fahrunfalle: Dank ESP verunglucken Mercedes-Personenwagen seltener (in German), Mercedes Benz, http://www.whnet.com/4x4/pix/esp_stat.jpg, retrieved 2007-12-28, "Road accidents are rare with ESP Mercedes passenger cars"
^ Road Casualties in Great Britain, Main Results (Transport Statistics Bulletin ed.). Office of National Statistics. 2005. http://www.dft.gov.uk/162259/162469/221412/221549/227864/227892/roadcasualtiesingreatbritain5108. Retrieved 2008-01-01. ^ "Road Traffic Deaths Index 2009 Country Rankings". http://www.photius.com/rankings/road_traffic_deaths_country_rankings_2009.html. Retrieved 1010-02-02. .
^ "WHO Disease and injury country estimates". World Health Organization. 2004. http://upload.wikimedia.org/wikipedia/commons/3/3e/Road_traffic_accidents_world_map_-_DALY_-_WHO2004.svg. Retrieved Nov. 11, 2009. ^ a b "www.searo.who.int". World Health Organization. http://www.searo.who.int/LinkFiles/whd04_Documents_un_secretary_general_report_on_orad_traffic_injuries.pdf. ^ "BBC NEWS | Special Reports | UN raises child accidents alarm". http://news.bbc.co.uk/2/hi/in_depth/7776127.stm. ^ Mokdad AH, Marks JS, Stroup DF, Gerberding JL (March 2004). "Actual causes of death in the United States, 2000". JAMA 291 (10): 1238–45. doi:10.1001/jama.291.10.1238. PMID 15010446. http://www.csdp.org/research/1238.pdf. ^ "Report on Injuries in America :: Making Our World Safer". http://www.nsc.org/resources/library/report_table_1.aspx. ^ "Motor Vehicle Collisions Most Frequent Cause of Severe Injuries". http://secure.cihi.ca/cihiweb/dispPage.jsp?cw_page=media_24jan2002_e. ^ However, the first known account of this crash dates to 1801. "Le fardier de Cugnot". http://www.ile-de-france.drire.gouv.fr/vehicules/homolo/cnrv/histoire.htm. ^ "WHO | Road safety: a public health issue". http://www.who.int/features/2004/road_safety/en/. ^ Dent, Edward Joseph. Handel. R A Kessinger Publishing. pp. 63. ISBN 1-4191-2275-4. ^ "CDC - Motor Vehicle Safety". Center for Disease Control and Prevention. http://www.cdc.gov/MotorVehicleSafety/index.html. Car Accident Pictures 5000 photos and stories of car accidents. Car Crash Information Site More Information about car accidents. A car accident is when one or more cars crash into something. Many more car accidents happen when people drink alcohol. Car accidents are a major cause of death in places where there are many cars. I'm a good driver: you're not! - Drivers.com: "I'm a good driver: you're not!"